Office of Solicitor, Benefit Security Division, Washington, D.C.
Kevin Nolt focuses his practice on qualified retirement plans, including defined benefit plans (both traditional and cash balance plans) and defined contribution plans (401(k), profit sharing, ESOPs and money purchase pension plans), and plans of tax exempt entities and public schools and universities, including 403(b) and 457 plans. His clients include benefit plans, service providers and employers of all sizes and industries, including Fortune 50 companies. Kevin works with clients regarding plan administrative issues; plan, SPD and amendment drafting; service provider and investment management agreement reviews; M&A due diligence and a variety of retirement plan qualification matters. Kevin has assisted clients with responding to and negotiating the successful completion of IRS and DOL plan audits. He has also prepared many applications on behalf of clients under the various IRS and DOL correction programs. He has been very successful in obtaining the IRS’s approval of creative corrective measures under VCP that provide the most cost-effective resolution for his clients. 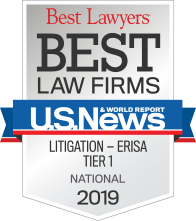 Kevin regularly counsels employers about their fiduciary duties under ERISA, including with respect to plan governance, benefit claims, required plan notices, and selection and monitoring of plan service providers. He also provides fiduciary training to plan committees or to others who serve as the fiduciary of ERISA plans. Kevin is Chair of the firm’s annual client seminar committee. He regularly presents and publishes content of the hottest issues for employers in ERISA and employee benefits. 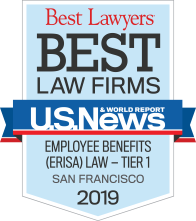 Most recently he presented “ERISA Pre-Approved and Customized Benefit Plans: Overhauled IRS Procedures and Determination Letter Process” to provide guidance to employers seeking to transition from individually designed to pre-approved plans. Kevin is currently serving as the President of the Western Pension & Benefits (WP&BC), San Francisco Chapter. Prior to being nominated as President, he served on the WP&BC Board of Directors for nine years and also participated in its membership and program committees. WP&BC brings together professionals involved in pension and other employee benefits work to promote education, exchange information, and foster sound principles and practices in the field. Kevin also is a member of The American Society of Pension Professionals & Actuaries (ASPPA) and is involved with the National Institute of Pension Administrators (NIPA). He is also on the planning committee for the NIPA Annual Forum and Expo.